For many years, I was intimidated by doctors. I grew up thinking the doctor was always right. I have a crooked little finger that resulted from a doctor telling my mom it wasn't broken. It apparently was. 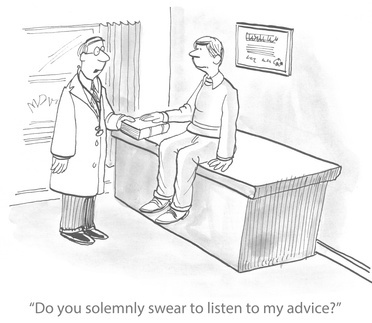 It wasn't until I had children of my own that I learned the value of getting a second opinion when a patient has any question at all about your doctor's diagnosis or the treatment he or she may recommend. Amblyopia is also called "Lazy Eye". My son's (Lance's) eye never seemed to be lazy. Lance was hyperactive back in the late 70's before ADHD had become an acronym. Of course, we didn't know that at first. In the beginning, we thought he was clumsy. At age four he constantly ran into doorways and other things. He would run full-speed through the length of the house and bam! Just as he reached the kitchen (the only downstairs room that had a standard door frame) he would run smack dab into the woodwork. After a couple of goose eggs, we decided it might be a good thing to bring his behavior to our doctor's attention. Our doctor immediately spotted the weakness in our son's left eye and referred us to a local ophthalmologist who started a litany of treatments for amblyopia. First we patched his good eye. Then he wore glasses that had the right lens blacked out and then we patched with glasses to make sure no light was getting into his good eye. Then we started the whole regimen again. The idea was to force the weak eye to become stronger. It was stressful for us and traumatic for our son. Especially since the ophthalmologist seemed to prefer patches during the summer when the adhesive would bond with the humidity and stick so firmly that it pulled the skin from our son’s face around his eyebrow and upper eyelid. Although we religiously followed the doctor's regimen, there was never one iota of positive change. Confronted with that fact, the ophthalmologist simply called us liars and insisted that we couldn't possibly have followed his instructions. We decided to seek a second opinion. To our relief, our family doctor had seen the sores caused by the patches and referred us to a specialist at the Mayo Clinic. The doctor at Mayo did a kind of eye test where Lance had to look at a light through something like a telescope. If he had been successful in focusing on the light, it would seem to have broken into pieces like shooting stars. The doctor said he "would have seen Star Wars." What 6-year old boy wouldn't want to succeed at that? He wasn’t successful. The doctor emphasized that fact that we were not at fault. He told us that the brain makes the decision about shutting down one eye or the other. He said that when our son was an infant, he most likely saw two mommies because his eyes weren’t coordinating. When that happened. his brain knew there was only one mommy because there was only one voice. It made the decision to shut down his eye. Once the brain makes such a decision, the window of time you have to reverse the decision is minimal if at all. There was never a chance we could have reversed Lance's amblyopia. I asked the doctor why the ophthalmologist had done all the patches and glasses and so on. The Mayo clinic doctor was familiar with the ophthalmologist's work and told us that while the ophthalmologist was a genius in cataract surgery, he was not good with amblyopia because his practice was focused almost entirely on operating on the cataracts of the elderly. The doctor told us that when our son passed puberty, if the eye was noticeably unsteady, we might want to consider surgery to cut the muscle which would keep the eye from wandering. Our son never wanted the surgery and although he had 20/200 vision in that eye, it didn’t wander so we were lucky in that respect. Amazingly, Lance's vision in his strong eye was 20/10 as if it were compensating for the vision he had lost. We were also lucky that we got that second opinion. It saved us heartache and worry and ended a traumatic treatment for our son. The ophthalmologist that first treated our son wasn't a demon or a quack. He just didn't deal well with small children, or at least with our child. Getting that second opinion made us see that doctors are people. They have good days and bad days. Sometimes they get it right and sometimes they don't. It's up to us to be sure we and our loved ones get proper care. If there's any question at all, get a second opinion. Even if you find the first opinion was right, the second opinion will give you peace of mind.